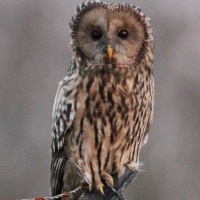 The Ural Owl is a large owl with a round head, no ear-tufts, and a relatively long tail with a wedge-shaped tip. Light and dark morphs are known to occur, with the light form being more common. Typical male - Kishert district, Russia. June 1995. © Vadim Lapushkin. Description: Light morph: The prominent, round facial disc is uniform dirty whitish to pale ochre-grey. The rim around the disc consists of rows of small dark and light, pearl-like spots. The relatively small eyes are dark brown, with the rims of the eyelids pink to reddish. Cere is dirty yellow and the bill is yellow-horn. The throat is whitish. 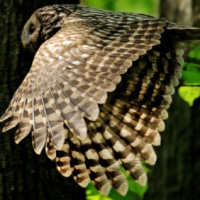 Upperparts are pale greyish-brown, mottled, spotted and streaked with whitish and dusky. The scapulars have large areas of white, forming a row across the shoulder. Flight feathers are conspicuously barred light and dark. The dark brown tail is relatively long and somewhat wedge-shaped, with 5-7 broad greyish-white bars. The central tail feathers are also barred. Underparts are very pale greyish-brown to dirty white, heavily streaked brown. Tarsi and toes are thickly feathered pale greyish-brown to dirty whitish-cream, and the claws are yellowish-brown with darker tips. Size: Length 50-62cm. Wing length 267-400mm. Tail length 201-317mm. Weight 500-1300g. Females are heavier than males. 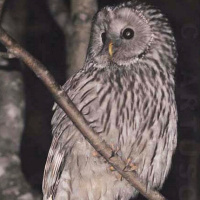 Habits: The Ural Owl is active mainly at night, with peaks at dusk and just before dawn. Roosts during the day close to a tree trunk or in dense foliage. They are normally not shy, and can often be approached quite closely. During the breeding season they can become quite aggressive near the nest. Voice: The song of the male is a deep rhythmic sequence of notes with a pause of about 2-3 seconds after the first double note - wuhu huwuho-huwuwo. This phrase is repeated at intervals of 10-50 seconds. The female has a similar higher-pitched song which is hoarse, giving it more of a 'barking' quality. There is also a heron-like kraoh that is uttered by both sexes, as well as a rough barking series of nasal notes that is given in aggression. A hoarse kuwett is likely a contact call. 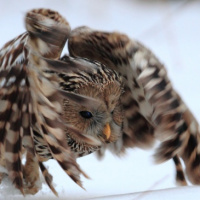 Hunting & Food: Ural Owls feed on a wide variety of mammals, birds, frogs and insects. The main prey are voles (60-90%), shrews, mice and rats. They will also take other mammals up to the size of small hares. Surplus food is stored at the nest or in nearby caches. 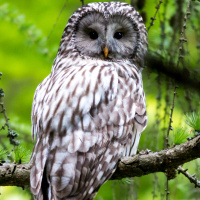 This owl hunts mainly from perches. Breeding: Males claim territories by singing from different perches, and during courtship may be heard dueting with their mates. 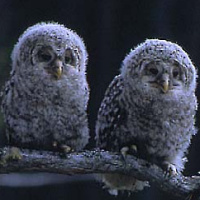 These owls generally pair for life and maintain the same territory for many years. 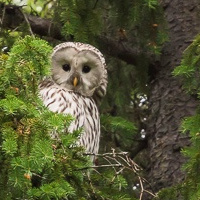 Nest sites include large natural holes in trees, cavities left by large broken-off branches, hollow trunks, fissures and holes in cliffs or between rocks, and holes in buildings. They have also been known to use stick nests of larger birds as well as squirrel dreys. 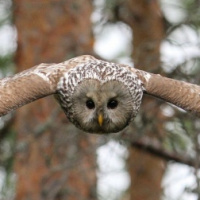 In Finland and surrounding countries, there are a vast number of artificial nest boxes used by these owls. Egg laying is from late March to mid-April, when 3-4 (sometimes 1-6) white eggs are laid directly on the bottom of the nest at intervals of about two days. Eggs are white, and are 46.5-52.3 x 39-44mm and weigh 46-48g. The female incubates the eggs alone, beginning with the first egg, while the male provides the food. Incubation lasts 28-35 days, and the young hatch at the same intervals as the eggs were laid. 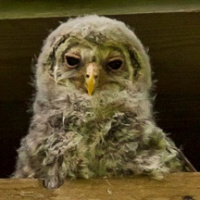 Nestlings leave the nest site when they are about 35 days old, and can fly fairly well at about 45 days. 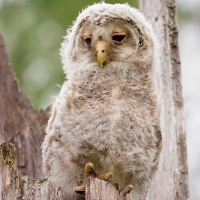 They are cared for and fed by both parents for about two months after leaving the nest, and reach sexual maturity before 1 year. 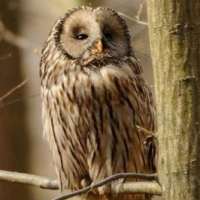 Habitat: The Ural Owl lives in mature, but not too dense, deciduous and mixed forest with clearings. In the northern part of its range, breeding habitat is open coniferous or mixed forest with tall trees and some clearings, often near bogs, and often mixed with alder and birch. 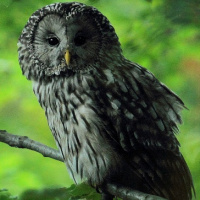 In southern parts, this owl occurs mainly in mature beech forests. 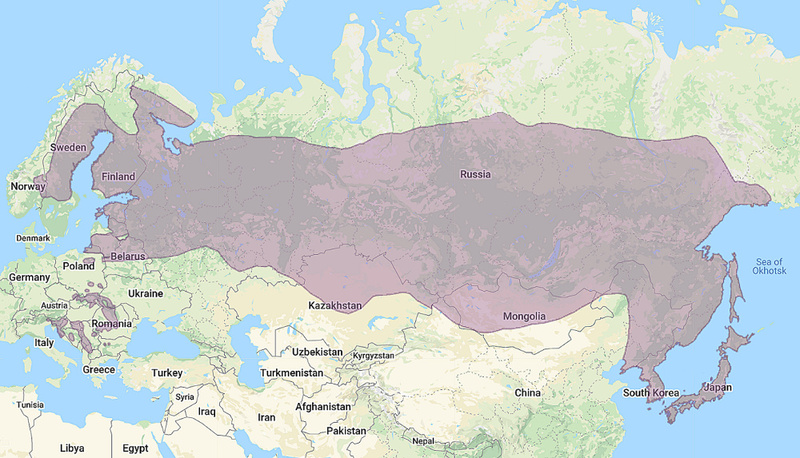 Distribution: Northern Europe from Norway, Sweden, Finland and the Baltic Republics through northern Russia and Siberia to Korea, coast of the Okhotsk Sea, Sakhalin and Japan. Also locally in Poland, Czech Republic, Slovakia, Slovenia, Croatia and Balkan countries. Original Description: Pallas, Peter Simon. 1771. Reise durch verschiedene Provinzen des Russischen Reichs (Reise Versch .Provin. Russ. Reichs; 1768-74) 1: p. 3. 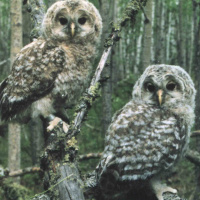 See also: Other owls from Europe, Asia, Genus: Strix. Page by Deane Lewis. Last updated 2015-11-08.